The value-added tax was first imposed in Europe starting about 50 years ago. Politicians in nations like France approve of this tax because it is generally hidden, so it is relatively easy to periodically raise the rate. And that’s the reason I am vociferously opposed to the VAT. 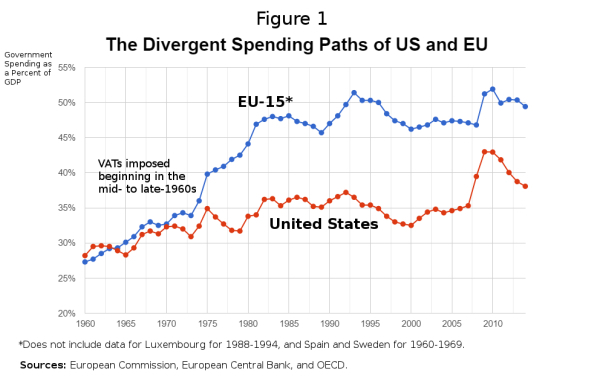 I don’t think it’s a coincidence that the burden of government spending dramatically increased in Europe once politicians got their hands on a new source of revenue. Simply stated, I don’t want that to happen in America. Now I have new evidence to support that position. We’ll start by crossing the Pacific to see what’s happening in Japan, as reported by Reuters. Japanese Prime Minister Shinzo Abe vowed to proceed with next year’s scheduled sales tax hike “by all means”… Abe said his ruling Liberal Democratic Party (LDP) won last year’s lower house election with a pledge to use proceeds from the sales tax increase to make Japan’s social welfare system more sustainable. …his plan to raise the tax to 10 percent from 8 percent in October next year. Abe twice postponed the tax hike after an increase to 8 percent from 5 percent in 2014 tipped Japan into recession. I give Prime Minister Abe credit for honesty. He openly admits that he wants more revenue to finance even bigger government. But that doesn’t make it a good idea. Japan has been experimenting with bigger government for the past 25-plus years and it hasn’t led to good results. The VAT was just 3 percent in 1997 and the Prime Minster now wants it to be three times higher. All of which is sad since Japan used to be one of the world’s most market-oriented nations. 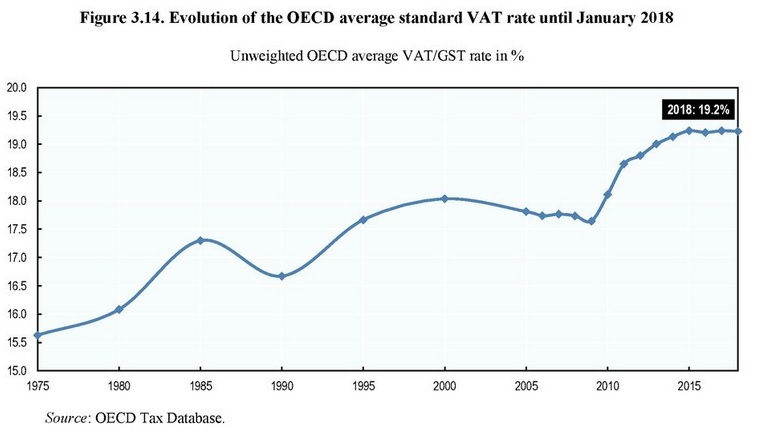 You also won’t be surprised to learn that the OECD is being a cheerleader for a higher VAT in Japan. Speaking of which, let’s look at what a new OECD report says about value-added taxes. VAT revenues have reached historically high levels in most countries… Between 2008 and 2015, the OECD average standard VAT rate increased by 1.5 percentage points, from 17.6% to a record level of 19.2%, accelerating a longer term rise in standard VAT rates… VAT rates were raised at least once in 23 countries between 2008 and 2018, and 12 countries now have a standard rate of at least 22%, against only six in 2008… Raising standard VAT rates was a common strategy for countries…as increasing VAT rates provides immediate revenue. And here’s a chart from the study that tells you everything you need to know about how politicians behave once they have a new source of tax revenue. Incidentally, there’s another part of the report that should be highlighted. For all intents and purposes, the OECD admits that higher taxes are bad for growth and that class-warfare taxes are the most damaging method of taxation. …increasing VAT rates…has generally been found to be less detrimental to economic growth than raising direct taxes. What makes this excerpt amusing (at least to me) is that the bureaucrats obviously want readers to conclude that higher VAT burdens are okay. But by writing “less detrimental to growth,” they are admitting that all tax increases undermine prosperity and that “raising direct taxes” (i.e., levies that target the rich such as personal income tax) is the worst way to generate revenue. Which is what I’ve been pointing out! Last but not least, I’ll recycle my video explaining why a VAT would be very bad news for the United States. Everything that has happened since that video was released in 2009 underscores why it would be incredibly misguided to give Washington a big new source of tax revenue. And that’s true even if the people pushing a VAT have their hearts in the right place. The only exception to my anti-VAT rigidity is if the 16th Amendment is repealed, and then replaced by something that unambiguously ensures that the income tax is permanently abolished. A nice goal, but I’m not holding my breath. P.S. One of America’s most statist presidents, Richard Nixon, wanted a VAT. That’s a good reason for the rest of us to be opposed. Dan, I think I may have come up with an “outside the box” idea for tax reform. Instead of just focusing on which consumption tax–be it, a value-added tax, the “fair tax” or the “flat tax”– should be advanced to replace the income tax, how about a focus on tax reform that ties a tax to a specific gov function. This would tie the source of the tax revenue to the function being funding. Or, to put it another way, tie an earmarked tax to to the specific, budgeted program. For example, an earmarked tax could be tied to defense spending. This would bring great transparency, by better revealing which group of taxpayers are actually having to pay for a particular, government function, and also focus on who (which group of taxpayers) ought to, actually, pay for that function. This would allow Congress to, more effectively, use its power of the purse, by non-funding a particular government function without having to impose a total government shutdown. Dan, I would very much like to hear your reaction to this suggestion. Essentially, poorer people got what they voted for. PS. I wonder what the equilibrium point is for VAT. That is, what is the tax rate where the more rational leftist politicians start thinking the French way: “We’d better not raise taxes any more, or we may have a collapse while I’m still in office, before I’ve had time to bail out and blame my successors”.